The greatest travel companion you could ask for – plus it fits into your pocket! Whether you are learning a language to travel to your dream destination or if you just need a quick and easy translation, the iTRAVL is here to help. Real time interactive learning programs like the Language Teacher and U-Learn go step by step teaching you a basic and advanced curriculum for language learning starting with Alphabets and going all the way to Dialogues. Pre-programmed phrases and speech recognition functionality allow you to speak and translate anything in the Audio Phrasebook and have it pronounced in a real human voice via speech to speech translation. Other features include a massive talking dictionary, electronic translator, full text translator, games to promote language learning and flashcards. LANGUAGE TEACHER - The BEST way to learn a language anywhere and anytime! The built in Language Teacher program was specially developed by linguists to successfully ease the process of learning a language. These interactive courses provide life-like correspondence between you and the iTRAVL to help you learn everything from the Alphabet to Words, Phrases and even Dialogues. U-LEARN - Even learn on the go! The U-Learn hands and eyes free learning system will teach you a language when you don’t want to look at a screen. Just launch this application and select your learning topic (anything from Food to Travel) and the program will start speaking to you and asking questions as if you’re conversing with a real human! This makes the entire learning process easier than ever before. AUDIO PHRASEBOOK - Travel made easy! With the learning programs above, the Audio Phrasebook application lets you speak into the device in English, Spanish, French, German, Italian, Polish, Portuguese or Korean and it will recognize what you say based on 14000 pre-programmed phrases! You can select a topic and choose your phrase or even work on your pronunciation. Each phrase is pronounced fluently in English, Spanish, French, German, Italian, Polish, Portuguese and Korean with the corresponding text provided. FULL TEXT TRANSLATION – Yes, type anything! The name says it all. Just type a word or phrase into this device using the on-screen bilingual virtual keyboard, and it will give you a perfect translation instantly. LEARNING GAMES AND MORE! Everything from games, to flashcards, SAT help and more are all built into the iTRAVL making it a one-of-a-kind resource for all your travel needs. Hangman, linguistic crosswords, notepad, calculator, metric and size converter, and word time clock utilities. 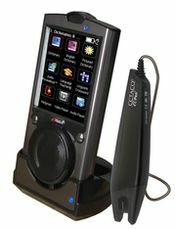 ECTACO iTRAVL handheld, C-Pen scanner, a cradle for PC connection and charging, AC adapter, headphones, USB cable, case, user manual and bonus CD are included in the package.